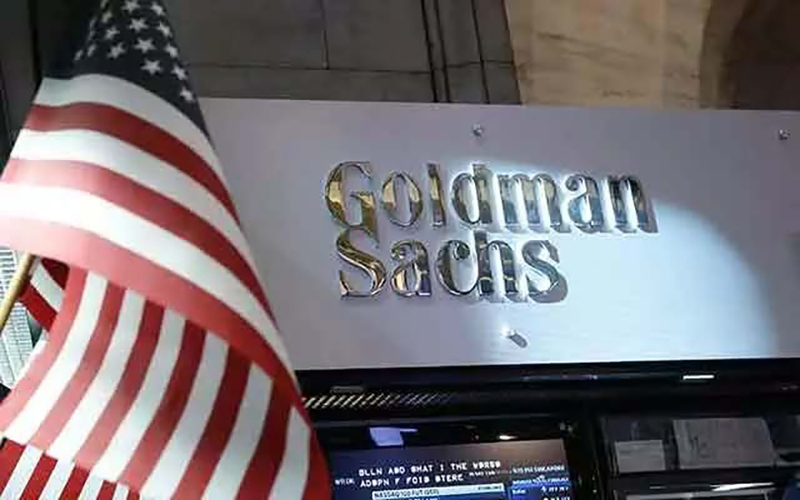 Goldman Sachs Group Inc (GS.N) fell short of earnings expectations on Tuesday due to a drop in quarterly trading revenue, prompting analysts to demand explanations for underperformance in an area where the bank usually outshines rivals. Newly appointed finance chief R. Martin Chavez said Goldman's clients traded less with the bank because markets were calmer and because it does not lend as much as competitors. Banks with bigger balance sheets, like JPMorgan Chase & Co (JPM.N), tend to profit not only from financing corporations but from capturing hedging and other markets-related business as well. "We underperformed this quarter," he said on a conference call with analysts. Analysts seemed unsatisfied with explanations from Chavez and outgoing CFO Harvey Schwartz. They were unusually tough during a Q&A session, with all but one of six pressing management about trading results, especially in fixed income. Goldman's 2 percent decline in trading revenue came in sharp contrast to results from JPMorgan Chase & Co (JPM.N), Citigroup Inc (C.N) and Bank of America Corp (BAC.N), which all beat estimates due to strength in trading. Credit Suisse analyst Christian Bolu said Goldman investors were showing some "nervousness" about the strength of the business, and UBS's Brennan Hawken chastised the performance, saying that topping the prior year should have been "kind of easy." "I'm not fully - I'm still confused," said Hawken, adding, "I have some company." Goldman's shares tumbled 4.8 percent to $215.44. During the first quarter the CBOE Volatility Index .VIX reached its lowest level since before financial crisis. Oil prices were also trading at years-low volatility levels. That lack of volatility meant its investor clients, many of them hedge funds, were trading less. Goldman's unusually large exposure to commodities trading also hurt its fixed income business. In the best of times, Goldman generated more than $6 billion in quarterly revenue from fixed-income trading. In more recent years, the business has come under pressure from factors including weak market activity and new regulations that restrict what U.S. banks can do and how much capital they must hold against trades. Goldman's profit rose from a difficult year-ago quarter, with earnings per share of $5.15 versus $2.68. But the results were well short of analyst forecasts of $5.31 per share, on average, according to Thomson Reuters I/B/E/S. Goldman has historically relied more on trading than other big banks, but has been trying to shift to relatively stable businesses like investment management and lending. Revenue from investment banking, investment management and investing and lending all rose in the first quarter, but not enough to offset the sharp decline in trading. Overall, Goldman's profit rose 80 percent to $2.2 billion from $1.2 billion in the first quarter of 2016, when sliding commodity prices, worries about the Chinese economy and uncertainty about U.S. interest rates led to weak results across Wall Street. Its revenue rose 27 percent to $8 billion from $6.3 billion. The bank's expenses rose just 15 percent and it paid out a smaller share of its revenue to employees. Its closely watched compensation-to-revenue ratio was 41 percent in the first quarter, down from 42 percent a year earlier, but higher than the 38 percent ratio it reported for all of 2016. Goldman's chief rival Morgan Stanley (MS.N) will report on Wednesday. Goldman Sachs Group Inc (GS.N) on Tuesday became the first Wall Street bank this earnings season to report lower equities trading revenue, signaling it was unlikely to reclaim the top market share ranking from Morgan Stanley (MS.N) any time soon. People familiar with the business said a combination of outdated trading technology, a late effort to court quantitative funds and overall fee pressure on the bank's key clients has blunted Goldman's edge. It now ranks No. 2 behind its biggest rival. Last year, the once-dominant bank fell more than $1 billion behind Morgan Stanley (MS.N) in equities revenue, marking the widest-ever such gap between the firms. That gap, which has been growing for years, has raised pressure from investors looking for answers and prompted Goldman to rethink its strategy. "If they're not experiencing the same good results as their peers, you may have to question if they're owning up to their issues," said Jerry Braakman, chief investment officer of First American Trust, which holds Goldman shares. Goldman executives acknowledge that the business has taken a hit and say they are trying hard to turn things around. They point to some key hires and investments they have made in trading technology to win over new types of customers. But a full rehabilitation will take some time, they said. The executives requested anonymity because they were not authorized to speak publicly. A spokeswoman for Goldman declined to comment. Equities trading is a tough business for big Wall Street banks in the best of times. It has costly infrastructure, demanding customers and big operational risks. Profit margins have been razor-thin for some time, but the business is facing new fee pressure from struggling asset managers. In 2016, total equities revenue at the world's biggest banks fell 13 percent to $43.4 billion, the lowest level in four years, according to research provider Coalition. Other trends, like investors' shifting to passive management, have shaved $15 billion from the equities revenue pool since 2009, according to a report from Morgan Stanley and management consulting firm Oliver Wyman. Just a handful of players dominate the equities business, which also includes trading in ETFs and derivatives, lending to hedge funds through prime brokerage and providing research to investors. Goldman's problems began in 2012, when Morgan Stanley launched an equities trading overhaul called "Project Velocity," and began trying to win back clients it lost during the financial crisis. Goldman meanwhile began to stumble. Its head of electronic trading left in early 2013 and soon thereafter it suffered an embarrassing and costly trading glitch in the options market. Instead of developing light-speed technology to win over computer-driven money managers, Goldman chose to cater to institutional investors, like hedge funds, that it already had relationships with. The decision cost the bank dearly: high-frequency trading firms now dominate the stock market, representing 55 percent of U.S. daily volume. Meanwhile, active fund managers in Goldman's target audience have been struggling to attract assets and are doubling down on investments in computer models to cut costs. "If you're playing catch up in electronic trading, that's going to be an issue," said Benjamin Quinlan, chief executive & managing partner at Quinlan & Associates, a consulting firm that focuses on banks. "It's not that you can't succeed, but there is a natural first-mover advantage for firms that started investing in their low-touch platforms earlier." On Tuesday, Goldman said its first-quarter equities trading revenue fell 6 percent, compared to gains of 2 percent to 10 percent at Citigroup (C.N), Bank of America Corp (BAC.N) and JPMorgan Chase & Co (JPM.N). Morgan Stanley will report results on Wednesday. Goldman in 2015 took steps to build new trading, hiring Raj Mahajan to revamp electronic technology in equities trading to cater to quantitative hedge funds and institutional investors who are increasingly adopting algorithmic trading strategies. It also acquired Sweden's Pantor Engineering to help build out its electronic platform. Goldman executives say those efforts will take time to bear fruit, and focusing on ironing out quarter-to-quarter bumps in trading revenues should not overshadow existing relationships with clients. In discussing the first-quarter decline in a conference call on Tuesday, Chief Financial Officer R. Martin Chavez said management is less concerned with market share than with how profitable the business is, and whether clients are satisfied. "Trading businesses should be measured not so much on quarterly numbers but how well they serve clients," said Mike Mattioli, a portfolio manager at Manulife Asset Management, which holds shares in Goldman. "Goldman's management team thinks about it this way."